Hey, it worked for the New Yorker. Expect to hear wall-to-wall Obama from now until inauguration day a week from next Tuesday as the President-elect monopolizes all media—even comics books. The blitzkrieg has begun with the release of USA Today's Obama-rama special edition, which included the news that none other than Spider-Man would swing through the Bam-mania. 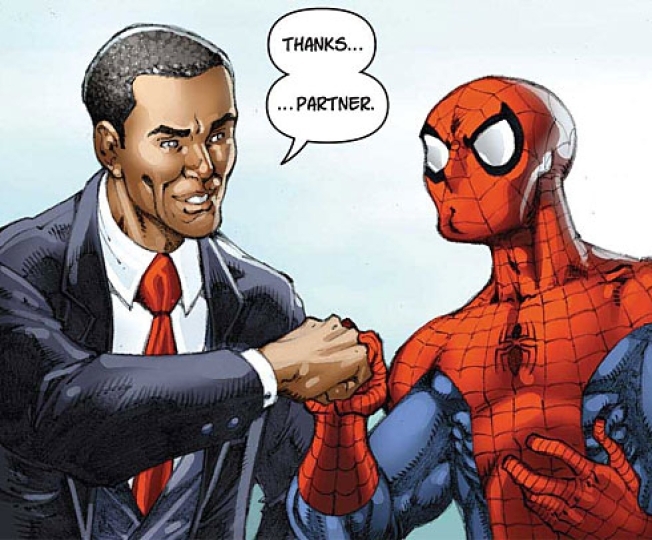 Obama makes an appearance in the Spider-man issue out next Wednesday in which the web-slinger saves inauguration day. Expect comic-book nerds to make a beeline for the nearest shops and copies of the $3.99 book to be fetching $20 bucks on eBay by the afternoon. If you're not going to make it to D.C. and got locked out of the City Hall simulcast, have no fear. The Brooklyn Academy of Music, better known, of course, as BAM, will be broadcasting the inauguration ceremony live on the BAM Rose Cinema screens for free. They are calling it "Bam in the House," no less—perhaps improperly implying that the Senator is being demoted to Congressman instead of taking the oath of office for the presidency. Or maybe they are just from '80s-era Brooklyn.